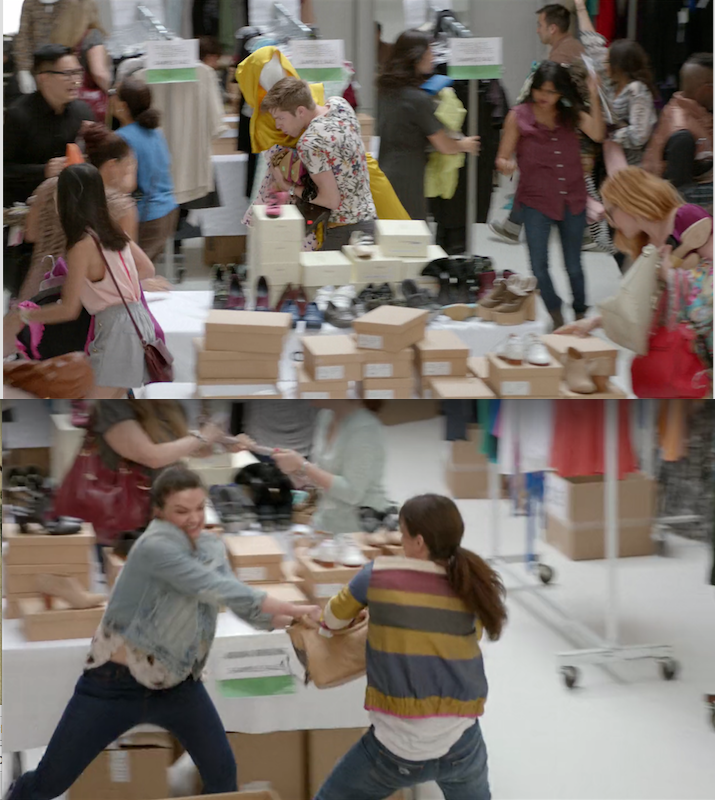 In Broad City's Season 3 premiere Abbi and Ilana go on one of their signature NYC epic days and one of the fun scenes they come upon is a crazy NYC warehouse sale. Finding enough clothes to fill a store size space with a limited budget to sustain the wear and tear required for the chaotic and vicious action required in the scene, was a challenge. We had to get resourceful so we asked some local fashion brands for product placement, hit up our favorite by the pound thrift store, bought some discounted high-fashion clothes, and lastly rented racks of clothes that were actually part of the location's actual pop-up sale inventory. But renting clothes at this quantity from someone can be tricky because they need it all back, and if you watch the sequence you see there is a lot of intense movement of clothes with lots of opportunity for confusion and mix-up. So one of my jobs was to take a detailed inventory of all the clothes we were renting so that we could be sure we returned everything after shooting. And have each piece of clothing back where it belonged. You can watch the whole, super fun, hilarious, and full of Broad City charm episode here.